The Common Core State Standards for Mathematics in Second Grade are Operations and Algebraic Thinking, Number and Operations in Base Ten, Measurement and Data, and Geometry. 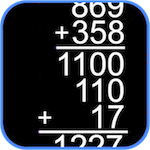 - Represent and solve problems involving addition and subtraction. - Add and subtract within 20. 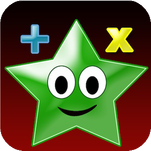 - Work with equal groups of objects to gain foundations for multiplication. 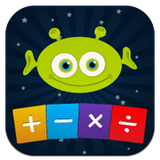 - Use place value understanding and properties of operations to add and subtract. $3.99 in the Apple iTunes Store. - Measure and estimate lengths in standard units. 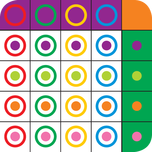 - Relate addition and subtraction to length. - Work with time and money. - Represent and interpret data. - Reason with shapes and their attributes. $9.99 for all chapters in the Apple iTunes Store. Free in the Apple iTunes Store with In-App Purchases.